Today in forex trading the Australian Dollar (AUD) strength was evident on all pairs. The USD (US Dollar) and JPY (Japanese Yen) also had some weakness. The AUD/USD and AUD/JPY both had strong upward movements, and both pairs broke resistance levels. The AUD/USD could continue higher to the 0.8200 resistance and the AUD/JPY could also continue higher to the 96.50 resistance area. The EUR/AUD also broke thorough important support and the strong downtrend on this pair should take over from here. The forex trading signals you see below are from The Forex Heatmap®, a visual map of the forex market. Today in forex trading the AUD/JPY signaled a buy on The Forex Heatmap®. The Australian Dollar (AUD) strengthened across almost all pairs. The USD and JPY had some weakness as well. This pushed the AUD/USD and AUD/JPY higher. The AUD/USD should continue to the 0.8900 resistance on the smaller time frames. The AUD/JPY has upside potential to the 98.50 resistance on the D1 time frame. The trading signals from the heatmap can be used for eight currencies and 28 pairs for live buy and sell decisions. The heatmap logic is based on parallel and inverse analysis. Today in forex trading The Forex Heatmap® had a buy alert on the AUD/USD. The Australian Dollar (AUD) strengthened late in the main session. This drove movement on several pairs in this currency group. Pairs like the AUD/JPY and AUD/USD moved higher. The AUD/USD is a short term movement back to the upside, so we would scale out lots and manage profit. The AUD/JPY is getting back into its long term uptrend and has potential to the 98.50 resistance area and beyond. The alert system you see below is The Forex Heatmap®, which provides live buy and sell alerts for 28 pairs. The heatmap also has the arrow system to alert you what pairs to consider first. 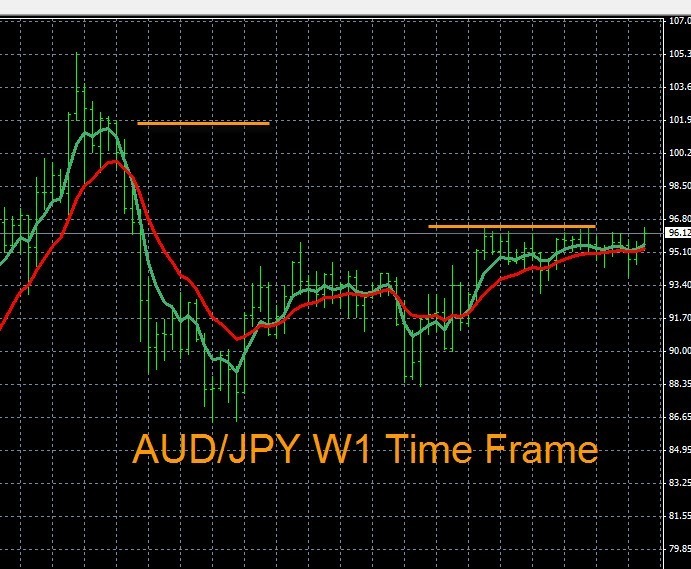 The AUD/JPY trend analysis indicates that this pair has a resistance breakout point at 96.50 on the W1 time frame. You can set a price alert here on your meta trader platform. Above that price when the alert hits, we would be looking for a buy signal on The Forex Heatmap®. The next resistance point past there is around 102.00, noted by the yellow lines. So the overall pip potential is around 550 pips, which is an excellent risk/reward ratio for this trade. Today in currency trading the AUD (Australian Dollar) strengthened on all pairs, causing movement in this group of pairs. The AUD/JPY moved strongly higher on JPY weakness and this pair has broken most short term resistance levels, it is now trending higher. We will continue to plan more buy entries on this pair. The EUR/AUD also dropped but this pair is inside of trading ranges on the H4 time frame so we would consider exiting this trade. The trading signals you see below are from The Forex Heatmap®, which provides currency signals for 28 pairs. Today in forex trading the AUD (Australian Dollar) weakness drove price movement on all pairs in the group. There was a strong downward move on the AUD/JPY, this pair is trending down on the D1 time frame and will continue lower. The GBP/AUD also rose to the 1.8200 resistance area, we would scale out some lots here and we will check the trends on this pair to see if it will continue. Check our next set of trading plans that will be published later today. Today in currency trading the AUD/JPY had a clear sell signal. This pair could continue lower for one to two more days and form a new support level. On an overall basis the forex market has a lot of AUD (Australian Dollar) strength remaining, so we would scale out lots on any continuing movement to the downside. If this pair stall at support we expect it to reverse back up at some point. The trading signals you see below are from The Forex Heatmap®, which gives live buy and sell signals for 28 pairs. Today in currency trading the JPY weakness drove price movement on all of the pairs in this group. There was also some AUD strength and NZD strength in the market so the AUD/JPY and NZD/JPY had good short term movements to the upside. The Japanese Yen (JPY) pairs and the overall market are still somewhat choppy so we would be careful with any new trade entries and scale out lots or exit completely. Most of these pairs are ranging on the smaller time frames and no strong trends exist on these pairs. Today in currency trading the AUD was strong on all pairs. This drove good price movement on all of the Australian Dollar (AUD) pairs. 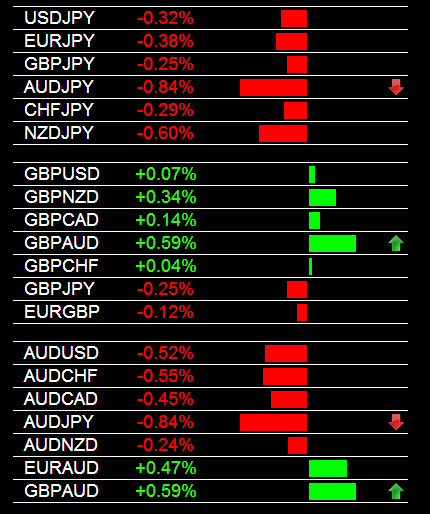 Pairs like the AUD/JPY and AUD/CHF moved higher. All of the AUD pairs are ranging on the smaller time frames, so we consider these to be short term intra-day trades. The currency strength indicator you see below is The Forex Heatmap®, which gives live trading signals for 28 pairs.